Served with gravy & Side White Rice. Each Plate served with Chicken Fried Rice, Egg Roll & Crab Rangoon. Tender pieces of chicken lightly battered in lotus flour sauteed with broccoli, snow peas, sweet pepper, and dried chili pepper in a slightly sweet tangy spicy sauce. Tender pieces of chicken lightly battered in lotus flour & quickly fried until outside is crispy and tender inside then enhanced by a tangerine sauce. The tangerine rinds are cooling and enengizing. A splendid combination of jumbo shrimp, beef, and chicken. Dedicated balanced with a variety of vegetables in our special sauce. An excellent presentation, lobster meat in Szechuan chili sauce and general tso's chicken. A perfect balance of separation. An elegant combination of lobster, scallops and shrimp sauteed with vegetables in a delicate spicy garlic sauce. A favorite surf and turf dish, Happy family features chicken, beef, scallops, shrimps and roast pork served with our special blend of Chinese vegetables and enhanced with a traditional brown sauce. Chinese noodles fried in a pan then sauteed with shrimp, beef, chicken and vegetables and mixed with chef's special sauce. Two separate dishes. Jumbo shrimp in chili sauce & scallion beef. Served w. salad or soup, white rice. Served w. salad or soup & rice. Fried shrimp w. spicy mayo. Sliced seared tuna w. masago and scallion w. yuzu sauce. Crunchy spicy tuna wrapped avocado and tobiko w. ponzu sauce. Diced salmon w. fresh mango & black caviar w. honey wasabi sauce. Shrimp, cucumber & Boston lettuce. Shrimp tempura, avocado, spicy tuna, wrapped soy bean seaweed. Lobster meat, crabmeat, shrimp, avocado & tempura flakes wrapped by soy bean seaweed. Spicy tuna, tempura flakes, topped eel & avocado w. masago. Tuna, salmon, yellowtail, white fish, avocado wrapped white seaweed. Shrimp tempura inside top w. king crabmeat. Shrimp tempura, cucumber topped crunchy spicy tuna. California roll inside w. 5 pc raw fish & avocado on top. Salmon tempura, asparagus topped spicy crabmeat w. tempura flakes. Spicy tuna, mango, avocado, topped w. tuna & white tuna. Spicy crabmeat topped spicy salmon tempura flakes & wasabi tobiko. Eel, cucumber topped avocado w. eel sauce & tobiko. Eel, avocado, topped mango w. eel, mango sauce & tobiko. Soft shell crab, lettuce & cucumber w. eel sauce. Tuna, salmon, white fish w. masago & scallion. Salmon, crabmeat, avocado w. cream cheese. 9 pcs chef choice sushi w. tuna roll. 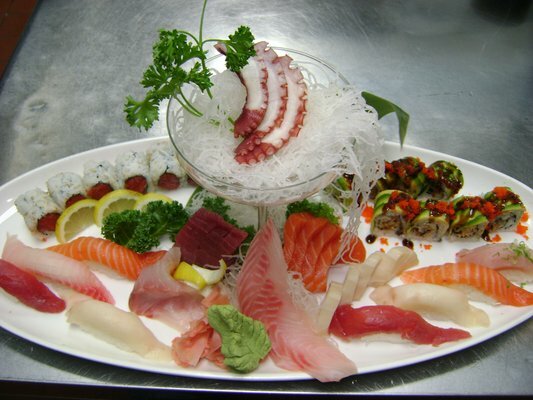 21 pcs chef choice sashimi w. steamed white rice. chef choice of 4 pcs sushi & 15 pcs sashimi w. California roll. 8 pcs sushi, 26 pcs sashimi w. dragon roll, spicy tuna. Ask manager for other dish.